Yuko Kaseki is Butoh dancer, performer, improviser, choreographer and teacher, based in Berlin since 1995. Her Solo and ensemble performances, improvisations are performed throughout Europe, Russia, Japan, Taiwan, Korea, Malaysia, Thailand, Canada, Mexico, Brazil, Uruguay, Argentine, Australia and the USA. These works are physical performance that incorporates Butoh dance, performing art with objects, texts, and soundscapes. Her third visit in Taiwan, this time she stays at Treasure Hill Artist Village. Her residency presentation will be shown on September 26th! A no-input noise artist, theatre music design, critic and organizer from Taipei. I was a guitarist in a rock band from 2002 to 2007. 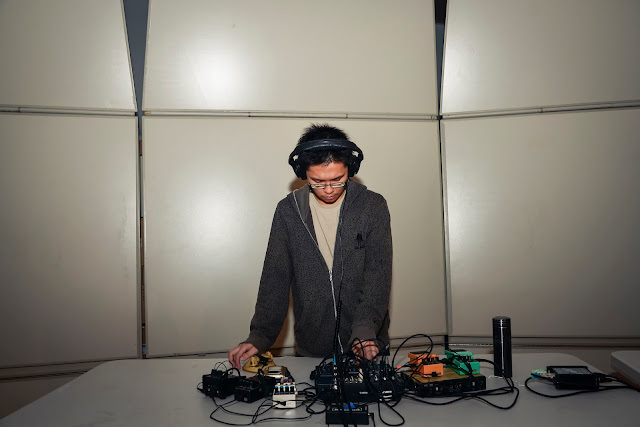 Since 2009, I have founded a label called Kandala Records that try to release sound works of mainly Taiwanese noise artists and musicians doing improvisation. In 2011, I collaborated with Dawang Yingfan Huang under the name Minkoku Hyakunen (民国百年) which got the honorary mentions of 'Digital Musics and Sound Art' of Prix Ars Electronica 2012.